William Stalker and John Mitchison entered their marks between 1774 and 1784 as the partnership split up in 1784. William Stalker was apprenticed to John Langlands I in 1774. John Mitchison died in 1792 and it is thought that William Stalker may have died in 1784 when the partnership ceased. These tongs are really rather special. They were made in three parts, the shoulder and the two arms. They have a “cut-in” shoulder which is fairly crudely hammered into shape, the inside of the bow still showing clear signs of having been shaped. 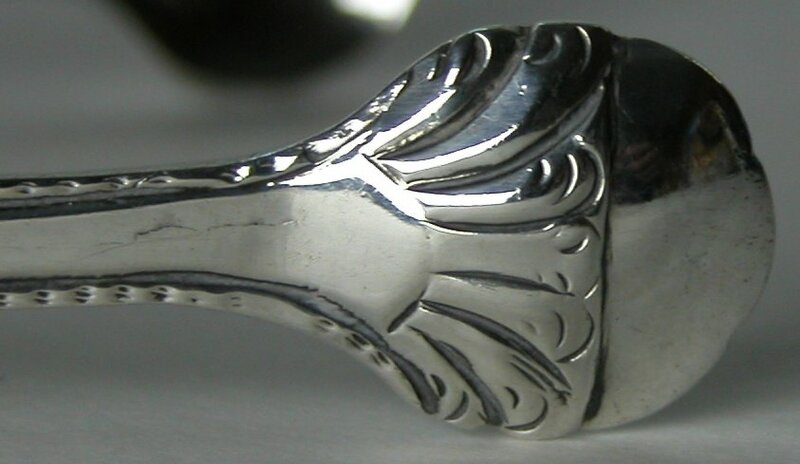 They have plain arms with a feather edge and an engraved “Adam” style flower engraved on the shoulder, which is very unusual for provincial tongs. The bowls are a half-shell shape, again this is an unusual shape for bowls. They are marked in the bowls with just the Lion Passant and maker’s marks.